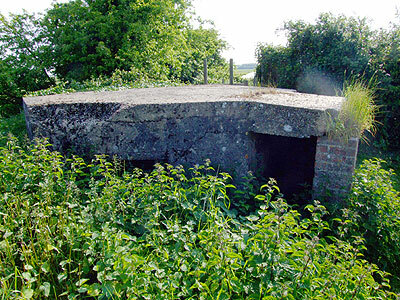 What was so interesting about this Type 22 pillbox (photo taken June 2006), that I had to go and visit it yesterday? 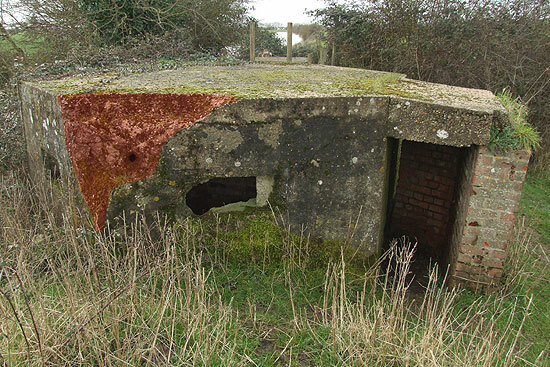 When I reached this pillbox during my first visit, I was way behind schedule, tired, and getting a bit complacent about Type 22s; at that point, each was starting to look pretty much like another. In my haste, I quickly fired off a few photographs and left promptly as I had a train to catch. As can be seen in the photo above, the vegetation is obscuring half of the pillbox, but it was a photograph that I took inside that alerted me to the fact that I'd missed something of interest the first time round. This photo shows damage to one of the embrasures - in fact, half of it is missing - and at top right there is a hole in the wall. 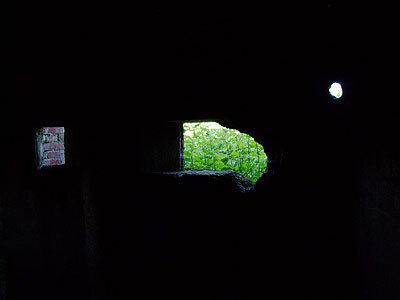 The brickwork at left is the entrance blast wall as seen through the small embrasure at the rear of the pillbox. This damage didn't impress me at the time; after all, I've seen Martello Towers with holes in them where they shouldn't have. There was damage to the east face and around its embrasure...so it was possible the damage had been done during the war...Sometimes, later in the war, pillboxes were used for training in infantry assault, and were damaged by explosives or pot-marked by bullets. I could have captioned that photo in my database as "possible wartime damage" and left it at that, but I wanted to be certain, and to get some better photographs. Vegetation obscuring the embrasures made it quite dark inside the pillbox last summer, and so I didn't really inspect the interior. But I wanted to know if it was wartime damage, or whether the local kids had sourced weapons-grade knicker elastic for their catapults and were able to punch holes through reinforced concrete using them. One thing that I knew would help prove beyond reasonable doubt would be evidence of projectile impact on the blast wall or interior surfaces of the pillbox. Let's quickly look at the external damage; the photograph below shows the eastern face of the pillbox. The damage to the embrasure is obvious; the red area highlights the damaged zone surrounding the hole.